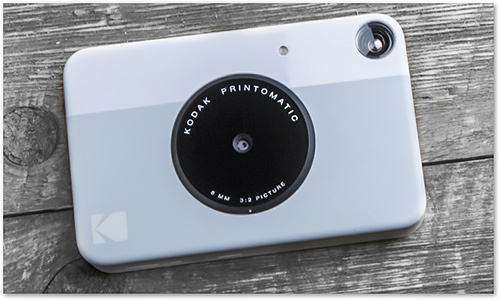 Kodak has introduced its Printomatic camera, a pocketable camera that can make small prints immediately after capture. The company describes it as an "instant print camera" but it doesn't use instant film, incorporating instead a battery-powered printer that does not use ink or toner. With a resolution of 10-megapixels, the Printomatic produces 2x3-inch photo prints with no ink cartridges, toner or film necessary. Photo prints are durable, water- and tear-resistant with an adhesive back. The camera can shoot a new photo while still printing the previous shot, too. "The Kodak Printomatic is a contemporary camera with a wonderful balance of digital and analog technology," says Steven Overman, president of Kodak's Consumer and Film Division and Kodak chief marketing officer. "It's an accessible device for anybody who wants to create a lasting memory in a tangible, colorful way." C+A Global manufactures and sells the instant print camera and media. Kodak and Kodak trade dress are trademarks of Eastman Kodak Company and are used under license by C+A Global. Kodak said the Printomatic would be available later this month for $69.99 at major retailers and online. The company did not release media pricing or specs. ROCHESTER, N.Y. and EDISON, N.J. -- Today Eastman Kodak Co. and its licensee C+A Global unveiled the Kodak Printomatic Camera, a brand-new instant-print camera. The stylish new point-and-shoot camera instantly prints high-quality, full color photos right from the camera body, making it the ideal all-in-one solution for capturing and sharing beautiful, vibrant prints instantly. The Kodak Printomatic Camera is the ultimate catalyst for a good time that can be shared instantly. Every day is a special occasion with the Kodak Printomatic Instant-Print Camera -- from graduations to family gatherings to relaxing getaways with loved ones. A perfect accessory for event planners, scrap-bookers, vacationers and partygoers, instant photography is the utilitarian-meets-fun solution for custom gifts and mementos. Wedding guests can snap candid photos of the ceremony and have them printed and framed before the reception starts. Creating custom scrapbooks is hassle-free when photos print immediately with adhesive backing ready to be added to the page. Events become more fun, weekend get-togethers are enriched and moments that once were forgotten on a smartphone are cherished forever. "We feel honored to partner with Kodak, a company that has established itself as a leader and storied brand in color technology used the world over," comments Chaim Pikarski, CEO of C+A Global. "This release is another step for Kodak entering into the growing instant digital camera market. The Kodak Printomatic Camera is the first of the full product lineup to be launched in 2017 and continue into 2018. The Kodak Printomatic Camera brings back the nostalgia of capturing and sharing Kodak moments, putting the print in the palm of your hand, the moment it happens." With a maximum resolution 10-megapixel camera and no computer connection or even WiFi needed, the Kodak Printomatic Camera produces 2x3" photo prints with no ink cartridges, toner or film necessary. Photo prints are durable, water- and tear-resistant with an adhesive back. Fun, fast and easy to use, the compact and fashionable Kodak Printomatic fits right in your back pocket and is perfect for sharing vibrant, smudge-free photos with friends and family, anywhere, anytime. Keeping up with all the fun, the camera can even shoot a new photo while still printing the previous shot, so you'll never miss a special moment. The Kodak Printomatic Instant-Print Camera is available in late September for $69.99 at major retailers and online including Amazon. The camera comes with a USB cable, a Quick Start Guide, a 10-pack of KODAK ZINK Photo Paper and a memory card. KODAK ZINK Photo Paper comes in 20 and 50 packs and is sold separately. More information is available at http://www.kodak.com/go/printomatic.